I saw three fish come swimming by on Fishmas Day, on Fishmas Day! I saw three fish come sailing by on Fishmas Day in the morning! This is an ice cream shop for your sims to visit. It's 100% Mac-compatible -- built in a Mac game, with EPs up to Bon Voyage and SPs up to Glamor Life Stuff only. The lot is cc-free, although the lot itself is a custom 1x2 community lot by Aeflaed on MTS. Remove the buffet table and place the ice cream machine where the buffet table was. The display cases are also empty, but can be filled with your very favorite ice cream-related deco or custom foods. There are lots and lots of options out there, and I don't want to clutter people's folders with things they won't use. 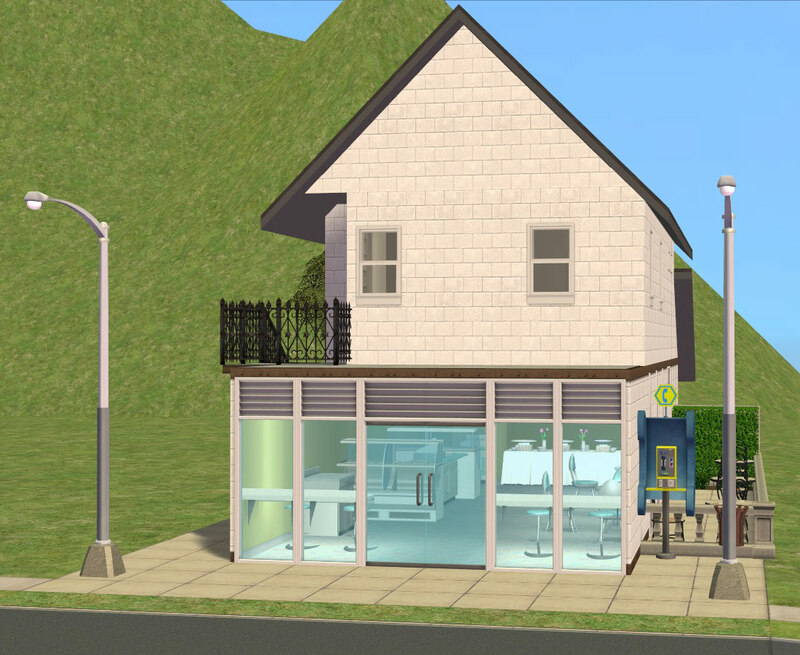 You can also swap out the counters and shelves for shannanigan's ice cream shop set available at TSR if you like -- the colors should coordinate just fine. There is an empty apartment above the shop that is just there because I like the look of apartments over businesses in the particular hood I built this lot for. The apartment is unfurnished -- obviously, it is for rent! I suppose you could change the lot zoning, remove one display case, and make this a home business instead if you wanted to. Pictures were take in my PC game, because the graphics are better on my PC (and I have a better screenshot program on that computer). Ceilings were added for the purposes of pictures only; the packaged lot is MAC FRIENDLY and does not have ceilings. Playtesting was also conducted on my PC, which is where the gameplay pictures come from. Please enjoy the lot, and remember: there is no such thing as too much ice cream! Gorgeous Santafish and Helperfish! Love it. It's going to go into my PV2 hood for sure. Omigosh! So awesome, I think i got brain freeze! Thank you SantaFish!! Thank you and your helpers! Truly wonderful! !